Following the format which had proved successful on previous occasions, there was an excellent turnout for the masters and first principal’s dinner at Woolton Golf Club, where the Woolton Group was pleased to welcome Deputy Grand Superintendent Paul Renton, Assistant Provincial Grand Masters Kevin Poynton and Sam Robinson and Provincial Deputy Grand Secretary Andrew Ridal. In addition, Provincial Deputy Grand Director of Ceremonies Mark Barton provided his usual skills to ensure the event ran smoothly. Also, in attendance were members from the other neighbouring groups. 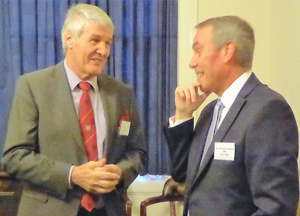 The evening started with the masters and first principals enjoying tea and biscuits, before meeting with the principal guest and other dignitaries in the Geoffrey Hirst Masonic Suite, before moving into the main dining room for the formal section of the evening, where everyone enjoyed a fine meal. Mark Barton managed the proceedings by keeping a watchful eye. Harry White proposed the toast to Paul Renton and provided the brethren and companions with a well-researched curriculum vitae of the principal guest, which outlined Paul’s Masonic career in some detail and his hobbies of walking and rugby. Harry concluded his toast by saying that Paul was an inspiration to us all and is to be applauded for his magnificent contribution to Freemasonry. In his response, Paul thanked all the group officers for their contribution to the effective running of the group, before going on to outline the rich heritage of the Royal Arch within the Province. Provincial Grand Scribe Nehemiah David Case proposed the toast to the Woolton Group, saying that the group had a wealth of experience and knowledge and was pleased to congratulate all those who would receive first appointments and promotions at the forthcoming Provincial Grand Lodge. 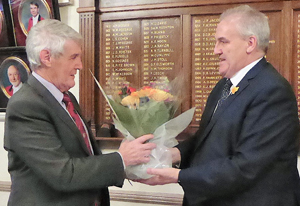 Paul Renton (left) receives flowers for his wife, on behalf of the group, from chairman Andy Whittle. Woolton Group Chairman Andrew (Andy) Whittle was pleased to respond to the toast and thanked our principal guest and his colleagues for attending and for the members of the group for supporting all the events which had been arranged by the group. Andy informed the brethren that the ever-popular pensioners Christmas party would be held again in December, after many requests from local organisations. The group is extremely pleased to support local charities and would continue to do so and one such charity Marie Curie, just down the road from the golf club, are looking to provide a small café, where patients could take visitors for a cup of tea and a piece of cake. The group will do all it can to support this venture, Andy said. In closing, Andy thanked his publicity team of Colin Roberts and Doug Lace, the group secretary Phil Gambrill and vice chairman Mike Cunliffe. Andy then had the greatest of pleasure of presenting Paul with two cheques; £1000 for the MCF 2021 Festival and £750, for the ‘Stars in your Eyes’ forthcoming show in Blackpool. Before the evening came to a close, Andy presented a bottle of libation to Paul, along with some flowers for his wife, before calling on the acting tyler Phil Gambrill to propose the final toast. Article and pictures by Colin Roberts. Next:A second time in the chair of Harthill for Dave.